Incorporating orange blossoms into the bride's costume originated in ancient China where they were emblems of purity, chastity and innocence. There are few trees so prolific as the orange; it is one of the rare plants that blooms and bears fruit at the same time, thus becoming symbolic of fruitfulness. During the time of the Crusades, the custom was brought from the East first to Spain , then to France , then to England in the early 1800's. By then, many enchanting legends had spread throughout the continent of maidens entwining fresh orange blossoms into a bridal wreath for their hair. The influence became so indoctrinated into the culture that the phrase "to gather orange blossoms" took the meaning " to seek a wife". Even America became enthralled with the bridal orange blossoms. The 19th century bride even decorated her gown with this symbol of fertility. But it was Queen Victoria who created the vogue for the sweet smelling blossoms when she wore them in a grand wreath for her 1840 wedding, and the classic floral theme for the Victorian bride was set. Ever since Winsor brides have taken care to tuck an orange blossom in their bridal ensemble. I love vintage wedding ideas, incorporating something originally made popular by Queen Victoria is a great way to create a vintage British theme. 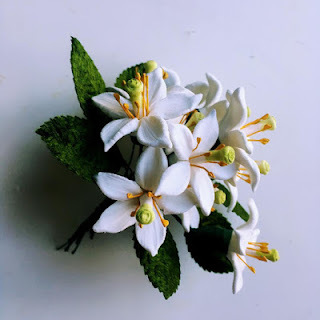 Is it possible to get more of the orange blossoms made? sure! -do email me at stjudescreations@yahoo.com -how many do you need?